Many people have given up making New Years resolutions because they often fail to keep them. I know I have struggled to keep mine in the past, but there are a lot of reasons for that. A good resolution should be something that is deeply significant to you. There are many spiritual growth resolutions that you may want to consider. Consider writing out your reasons for that goal to keep your motivation fresh. Sometimes my resolutions weren't specific enough or didn't include a plan, other times they were so specific they didn't allow for much grace. Finding a good balance is key. Also, keeping them always before you can help, but beware just becoming blind to that post-it on your bathroom mirror. When you notice yourself slipping- redesign it, re-position it, or re-write it. 1 Timothy 4:88 "for while bodily training is of some value, godliness is of value in every way, as it holds promise for the present life and also for the life to come." Pray for my family, friends, neighbors, co-workers, church, community, and world more regularly. Increase the regularity of your attendance at WSBC. Get into a Bible Study. Memorize scripture pertaining to a particularly relevant topic. Look for a new way to serve Jesus, his bride, and the "least of these". Discuss spiritual things with someone (evangelistic). What are you waiting for? Register now for the No Regrets Men's conference. You will be blessed by some fantastic national speakers sharing in the main sessions as well as some local pastors leading breakout sessions - including our very own Knute Larson. You don't want to miss this opportunity to keep growing in your faith and developing good friendships with other men. Make sure you sign up before the deadline! 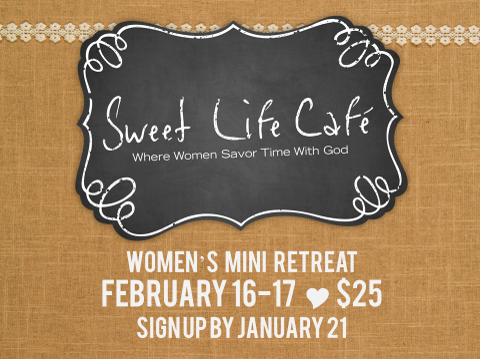 The Sweet Life is waiting for you at our women's mini retreat this February. You will love the small group focus, the thoughtful worship, and engaging activities for this two day mini retreat here at Woodland Shores. You can also give an admission ticket as a Christmas gift if you register soon. Sign ups end on January 21 so, make sure you get signed up this Sunday! Thank you all for an amazing Christmas celebration. It was a blessing to worship with you and your family. I know this season is only going to get colder, but let's not forsake meeting together throughout 2018. Remember, above all, YOU ARE LOVED!